HowToRepairGuide.com: Saturn SL2: How to replace Starter Motor? Go through the Starter motor replacing procedure for 1999 Saturn SL2. The Vehicle has to be on Jack-stands.The starter can be easily accessed from under the vehicle.Please give proper support to the vehicle,before getting under the vehicle. Here are the instructions for removing it. There are 2 bolts, the one on the top is going to be difficult to remove. You will need an extension to go over the top and behind the solenoid to get at it. Remove the top one first, so the weight of the starter isn't on the top bolt when you are removing it. Once the top bot is removed,then only remove lower bolt. 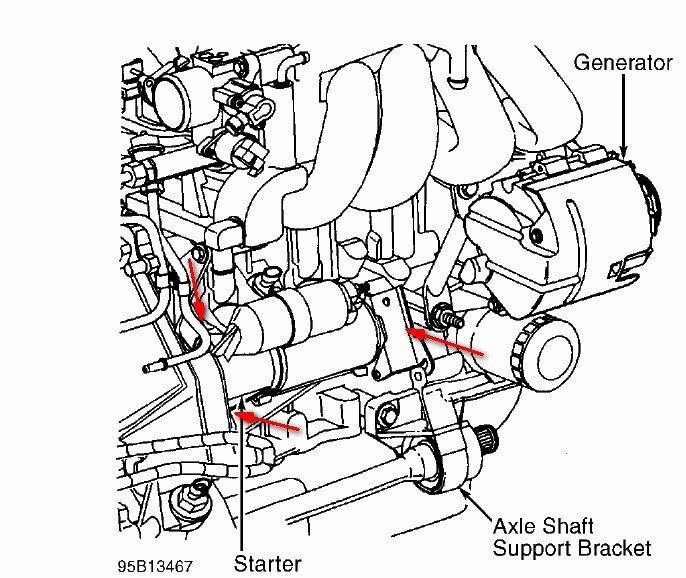 Once both the bolts are out.You should be able to clear the bracket near the end of the starter by pulling the starter out and away from the engine. If any of the two bolt or both bolts are very tight to remove,then get a rust remover spray from auto parts store and spray few drops on the side of screw.WD-40 spray works best in such cases. Sidecase Failure on 2004 Saturn ION 3?